Dominick Resler’s practice, patience and persistence have finally paid off. 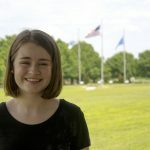 Resler, a student in the Business Technology program at Meridian Technology Center, is a senior at Perry High School and a member of TechHeads, Perry’s robotics team. For the past six years, he and his teammates have been waiting for a victory. The TechHeads are a part of the Boosting Engineering Science and Technology (BEST) Robotics contest for students across the country. Teams are given a build kit that includes an assortment of odds and ends. 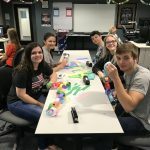 They have six weeks to use creativity and the engineering design process to construct and program a robot that will be able to compete against other schools. Resler serves as a lead robot driver for the team. After sweeping the state contest in Alva in late November, the team advanced to win first in the Frontier Trails BEST regional contest if Fort Smith, Arkansas. They took home several awards there, including an award presented to teams that embody the concept of boosting engineering, science and technology; an award for design; the most robust award and the third place Founders award. “It felt really, really good to win,” Resler said. While taking home the top prize will always be memorable, Resler knows it will be the skills he acquired during his time with the TechHeads and in the Business Technology program at Meridian that will set him up for success. 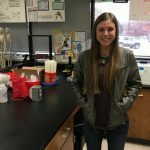 At Meridian, Resler is studying entrepreneurship, learning the fundamentals of technology, business development, business management and accounting. He is also an officer for the afternoon chapter of Business Professionals of America, a Career Tech Student Organization, and a member of Meridian’s Leadership Class. High school, homeschool and virtual school students who live in Agra, Carney, Glencoe, Guthrie, Morrison, Mulhall-Orlando, Pawnee, Perkins-Tryon, Perry and Stillwater school districts can attend Meridian tuition-free during their junior and senior years. Sophomores can enroll for afternoon programs when space is available. The Biomedical Science and Pre-Engineering STEM Academies are open to sophomores, juniors and seniors. Students spend part of their day at their high school and part of the day at Meridian. The priority application deadline for fall 2019 is February 1. For more information on Meridian’s 20 plus career training programs visit meridiantech.edu/programs. 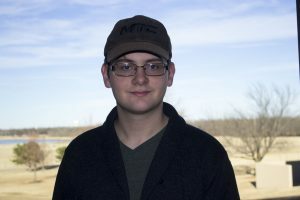 Dominick Resler, a student in Meridian’s Business Technology program, has achieved success at Tech and Perry High School with the TechHeads robotics team. The team recently won first place in the Frontier Trails BEST regional robotics contest. Resler drives the robot for the TechHeads.